Voorhees, NJ – In the final day of camp, tomorrow is the Trial on the Isle, I saw just the 3-on-3 scrimmages. There were two run simultaneously and then there was a final. Don’t expect me to tell you the score. I was strictly watching for attribute. David Kase – 5th round in 2015 – 5-11, 170, RW – His numbers in the Czech league finished strong and he had 4 points in 7 games in the World Junior Championships. Today he exhibited some great speed bursts, strong turns, excellent stick and puck control and one filthy goal. I could see him coming over next year to play in the AHL to start when he’s 20 and a bit stronger. Pascal Laberge – (2nd round pick in 2016) – 6-1, 162 (probably 170) – His fast twitch muscles are impressive. Once again his stick and puck control gave him and his teammates scoring chances. He engaged well defensively, this part of his game is evolving, and he has a very fast shot. He scored a few nice goals. He has a lot of upside and ability that you can’t teach a player. Connor Bunnaman – 4th round in 2016 – 6-1, 207, C – This kid is built like a bottom six NHL center. He has size, his strength is already pretty good and will improve, and his passing is really sharp. He plays in Kitchener, probably will see more time with Jeremy Bracco this season and he has a good shot. He has upside. Travis Sanheim – 17th overall in 2014 – 6-4, 201 – D – He’s still on a quest to gain muscle. Look for an exclusive on him in the coming days. He was the second best defenseman in camp. Provorov is better. There’s nothing new to report there. He was the best. Sanheim has more power behind his shot and his skating now. He’s worked very hard on his skating. He pinned Travis Konecny against the boards without much problem. He still has loads of upside. Reece Willcox – 5th round in 2012 – 6-4, 205 – D – He plays a boring, smart and simple game. He can break down plays, make smart and safe passes and get the puck out quickly. I expect him to have a great year in Lehigh Valley this season. 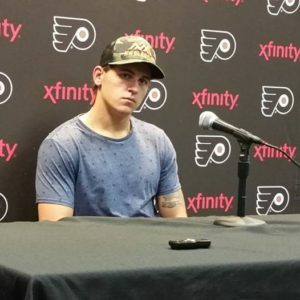 Carsen Twarynski – 3rd round pick in 2016 – 6-2, 198 – LW – He improved a lot and had a nice goal or two in the scrimmage and a forearm shiver that dropped the guy defending him. He has a lot of moxy. Carter Hart – (2nd round pick in 2016 – 6-1, 181) and Ivan Fedotov (7th round pick in 2016 – 6-6, 192 – G) had solid efforts in a game that basically hung goalies out to dry most of the time. Fedotov made some sprawling saves that caught my attention. Hart just played solid. Stoned a few point-blank shots and is a guy who is very smart on and off the ice. Just because I didn’t write about a player doesn’t mean they didn’t have a solid camp. It’s about development not competition, well until today, when they did keep score. Look for more on Bunnaman and a few others this summer.